For K-dwarf partially convective stars less than 0.5 solar masses, see red dwarf. A K-type main-sequence star (K V), also referred to as an K dwarf, is a main-sequence (hydrogen-burning) star of spectral type K and luminosity class V. These stars are intermediate in size between red M-type main-sequence stars ("red dwarfs") and yellow G-type main-sequence stars. They have masses between 0.5 and 0.8 times the mass of the Sun and surface temperatures between 3,900 and 5,200 K., Tables VII, VIII. Better known examples include Alpha Centauri B (K1 V) and Epsilon Indi. These stars are of particular interest in the search for extraterrestrial life because they are stable on the main sequence for a very long time (20 to 70 billion years, compared to 10 billion for the Sun). Like M-type stars, they tend to have a very small mass, leading to their extremely long lifespan that offers plenty of time for life to develop on orbiting Earth-like, terrestrial planets. 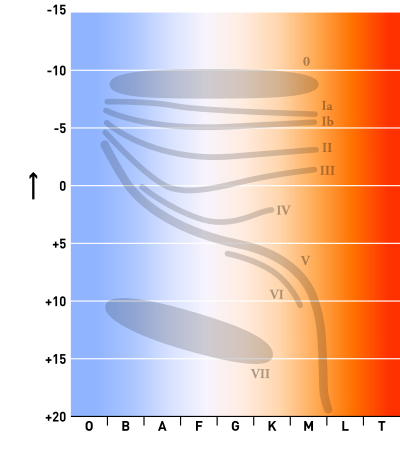 In addition, K-type stars emit less ultraviolet radiation (which can damage DNA and thus hamper the emergence of nucleic acid based life) than G-type stars like the Sun. K-type main-sequence stars are also about three to four times as abundant as G-type main-sequence stars, making planet searches easier. While M-type stars are also very abundant, they are more likely to have tidally locked planets in orbit and are more prone to produce solar flares that would more easily strike nearby rocky planets, making it much harder for life to develop. Due to their greater heat, the habitable zones of K-type stars are also much wider than those of M-type stars. For all of these reasons, they may be the most favorable stars to focus on in the search for exoplanets and extraterrestrial life in the universe, especially if they are cooler (K6V–K9V, specifically those of the stellar class K7.5V temperate). The revised Yerkes Atlas system (Johnson & Morgan 1953) listed 12 K-type dwarf spectral standard stars, however not all of these have survived to this day as standards. The "anchor points" of the MK classification system among the K-type main-sequence dwarf stars, i.e. those standard stars that have remain unchanged over the years, are Epsilon Eridani (K2 V), and 61 Cygni A (K5 V). Other primary MK standard stars include 70 Ophiuchi A (K0 V), 107 Piscium (K1 V), HD 219134 (K3 V), TW Piscis Austrini (K4 V), HD 120467 (K6 V), 61 Cygni B (K7 V) . Based on the example set in some references (e.g. Johnson & Morgan 1953, Keenan & McNeil 1989), many authors consider the step between K7 V and M0 V to be a single subdivision, and one rarely encounters K8 or K9 classifications in the literature. Recently, however, HIP 111288 (K8V) and HIP 3261 (K9V) have been proposed as spectral standard stars. Some of the nearest K-type stars known to have planets include Alpha Centauri B, Epsilon Eridani, HD 192310, Gliese 86, and 54 Piscium. ^ SIMBAD, entries for Alpha Centauri B and Epsilon Indi, accessed on line June 19, 2007. ^ David Shiga (May 6, 2009). "Orange stars are just right for life". New Scientist. Retrieved May 29, 2016. ^ , retrieved on February 8, 2015. ^ , retrieved on May 6, 2009.